The 4G LTE SIM card in your device contains information about your plan, device and more. You can set a SIM PIN so others won't be able to access that information if your SIM card is removed from your device. If you remove your SIM card and insert it in another device (e.g., when you upgrade to a new device), you'll be asked for the SIM card PIN. You can find your SIM card PIN in My Verizon if you've forgotten it. Or, if you've entered your SIM card PIN unsuccessfully 3 times, you'll need the PIN Unblocking Key (PUK) to unlock your SIM card again. After using the PUK, you'll need to create a new PIN for your SIM card if you want to secure it again. Go to the My Devices page in My Verizon. 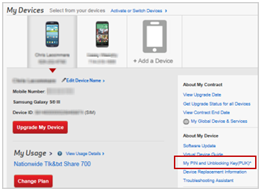 Tap or click My PIN and Unblocking Key (PUK) under "About My Device". Your default PIN and PUK will be displayed in a pop-up window. Tap or click Close when you're finished. You've successfully found your SIM PIN and PUK.